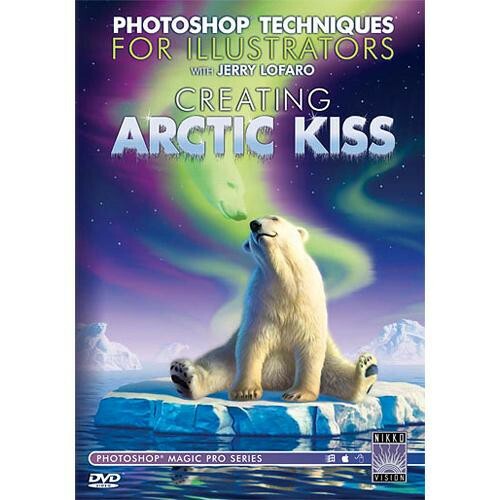 Creating Arctic Kiss - Join Jerry LoFaro as he creates an amazing illustration using Photoshop. Strating from scratch and using the many applications that Photoshop contains, you'll get first-hand instruction on using this dynamic software. About the Author: Jerry LoFaro is an award-winning illustrator whose client list includes: Random House, Harcourt, Ballentine, Avon, Bantam, Time Life, and Viking Penguin, Celestial Seasonings, Coca-Cola, Barcardi, Aflac, Levi's, Disney, Claritin, National Geographic, Nike, Panasonic, Kellogg's, IBM, and many more. Box Dimensions (LxWxH) 7.4 x 5.2 x 0.6"
DVD:Creating Arctic Kiss with Jerry LoFaro is rated 5.0 out of 5 by 1.